Mumbai: Foreign investors, who have pulled out nearly $240 million from Indian stocks since the beginning of the year, may continue selling after Wednesday’s interest rate increase in the US, but domestic institutions which have supported the markets so far are expected to cushion some of the blow, experts said. Wednesday’s quarter percentage point increase—the second hike this year and the seventh since it started increasing lending rates in 2015—takes overnight lending rate in the US to a range between 1.75% and 2%. The US Federal Reserve’s rate-setting panel also signalled two more rate hikes this year and dropped its pledge to keep rates low enough to stimulate the economy “for some time". Indian markets were nervous on Thursday, with the BSE’s benchmark index Sensex closing at 35,599.82 points, down 139.34 points, or 0.39%, while the Nifty was at 10,808.05 points, down 48.65 points, or 0.45%. According to Kamlesh Rao, managing director and CEO of Kotak Securities Ltd, markets have by and large digested the fact that Fed will raise rates steadily. 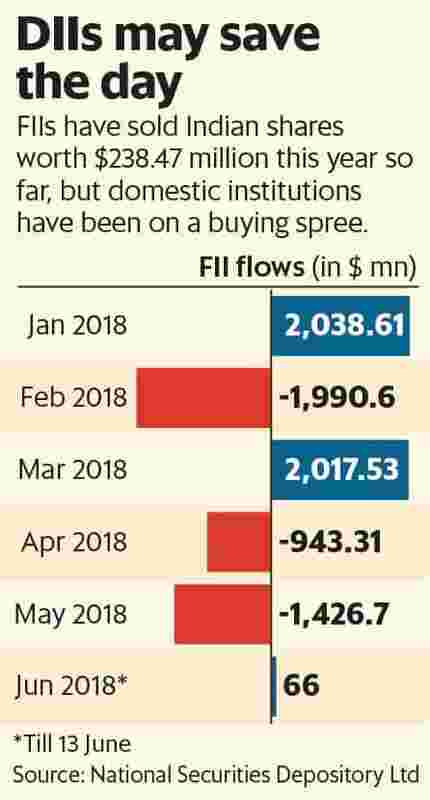 “FIIs (foreign institutional investors) have been net sellers in this year; so, markets have already bought it in and sustained that. As as long as the DII (domestic institutional investor) inflows continue, I don’t think markets will see much impact on account of Fed increasing rates," he said. Rao says if domestic liquidity is intact, it will cushion the outflow of foreign money from India. Higher interest rates tempt large foreign funds to move their money to the US, hurting emerging markets including India which are already struggling with a stronger dollar and expensive crude oil. Till date this year, FIIs were net sellers of Indian shares worth $238.47 million but have pumped in $66 million in June so far. In contrast, DIIs have bought shares worth Rs54,394.23 crore this year so far, and Rs5,922.77 crore in June alone. In 2018 so far, Sensex has gained 4.53% while the MSCI World and MSCI Emerging Market indices have surged 7.47% and 3.55%, respectively. The exit of long-term money will be a concern but it’s not unexpected, said Himanshu Srivastava, senior analyst and manager (research) at Morningstar Investment Adviser India. “There could be a couple of factors leading to this. A few investors who have been invested in the Indian markets over the last 3-5 years or even more might have chosen to book profit at this juncture, anticipating higher volatility in the Indian markets the closer it is to general elections. Additionally, the currency may also depreciate further if US Fed goes ahead and hike rates further. Hence, investors would have chosen to book profit now than riding the expected volatility going ahead," he added. However, according to Rao, the Fed hiking interest rates this year won’t be a major issue for Indian markets. He said Indian markets are worried about crude prices and domestic interest rates. “These are two factors playing in minds of investors where risk-reward ratio between debt and equity investment start narrowing down over a period of time. For India, micro is looking good. So the worries on fiscal deficit slippage are going to vanish in next two-three months when we start seeing robust GST collections," Rao added. Siddhartha Khemka, head of research (retail) at Motilal Oswal Financial Services Ltd, agreed that Fed rate hikes had already been factored in as FII money outflow already indicates. “Generally, rising interest rates suggest pickup in consumption and demand. It is a sign that US economy is getting stronger. For emerging markets, it is a short-term negative, but in the long term, a stronger developed market is supportive to emerging markets," he added. Meanwhile, Bank of America Merrill Lynch June Fund Manager Survey finds investors returning to US equities while emerging markets lose favour. “EM equities allocation falls again after massive drop last month, down -5% to net 22% overweight & well off the April’ 18 high of 43% as investors sell EM equities to buy US equities," the survey said on 12 June.